This is not your average rotary mulcher. 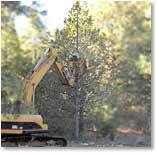 Watch the "SLASHBUSTER"® HD 480B brush cutter chew through 10-14 inch diameter trees with ease. No auxiliary engine is necessary. Horsepower-for-horsepower this is the highest performance tree shredder available. Maximize productivity by cutting with both left and right swings of the excavator. 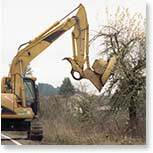 Shred vegetation near homes, utility poles, fences or other sensitive structures; contact with the teeth is virtually impossible. Mow roadsides without lane closures by safely directing mulched debris. Clear land - shreds brush and 8" diameter trees. "SLASHBUSTER"® "S-7" teeth are so strong, we decided to test them at our local wrecking yard. This Dodge Caravan was obliterated, yet the "S-7" teeth showed no significant damage or wear. Even though only 80 horsepower is behind this backhoe loader mounted SG 240 stump grinder, it grinds stumps much faster than digging them out with a bucket. Watch how the double heel rack comes in handy to dig around the sides of the stump when grinding below soil level.